I’m looking for a pink plush bear from Marks and Spencer. It was bought in 1995, and you could also get it in a different color. My little sister lost this bear when she was little and desperately looks for another one, but this has not been successful. She turns 18 in December, 2013, and I’m looking everywhere for another one, so I can surprise her it will make it a birthday she will never forget! Hi- I am looking for the bear as well. I have been searching for years since my daughter lost in on holiday about 8 years ago. She received as a gift from a friend in London in 1997. My daughter just turned 16 and I was hoping to find one by then. My goal now is to find it by her 18th. Have you had any luck? I’m still searching and if I find ‘pink teddy’, I’ll sure to be in touch. I’m still searching!! I have never seen another one like it except when my daughter was 4, we saw a little girl holding ‘pink teddy’ and her mom said it came from Hong Kong. I think it was a Tyco product. I’ve searched tyco, but no luck. We live in the Boston (USA) area. Oh my goodness, you are an angel! Thank you for finding this! I almost cried. However getting it isn’t as easy as I like. The seller will not mail to the US. I am trying to see if a friend’s family member will accept it and send it. Anyway, thank you so so so much for helping with finding Pink Teddy. And, congratulations to you for finding one for your sister. She is so lucky to have such a loving thoughtful sister. I’ve found a friend in England that I am having the teddy bear shipped to and she will send it to me. Thank you so much again for finding ‘pink teddy’! I’d love to hear about your sister’s response when you give it to her. Same here im am so glad we can stop looking knowing we have pink bear on her way! 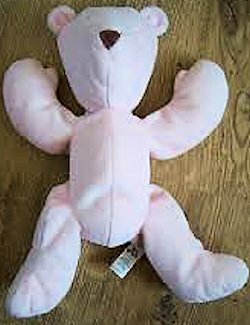 We even looked in the charity shops everywhere we went but no luck although we did manage to get my sister a blue one for 50p once but it never replaced the love for pinky. Im not quite sure yet im coming up with quite a few different ideas with my parents who cant believe I finally found one! Like you my mum almost cried when I told her! Both your ideas sound really lovely I would love to see her reaction. Im just really glad to have helped you out! I know its unbearable looking for something you cant find. Its made my day that ive made your day. I forgot to thank you for your offer to receive and mail pink teddy to me. I would have done the same for you! I’m still in disbelief that I found you and this website, which led me to getting pink teddy. The story will be so fun to tell when she gets pink teddy. THANK YOU AGAIN! SO glad you’ve both found Pink Bear!! This is exactly the way I envisioned Plush Memories working way back when I started it! I have a blue bear and I’m looking for another. Can anyone help me?